As part of Sugar Free September we’ve been chatting to Charlie and Harry, the pair behind one of our favourite fellow sugar free brands – Oppo. These two have been on a mission to create delicious, guilt free ice cream for a couple of years now, and they’ve certainly won us over with it. Have a read of our Q&A below, and head to their website to find out where you can pick up a tub. We love that Oppo combines health and indulgence, what inspired you to set out and create the brand? The Oppo journey began in 2011, when we went to Brazil to try and break a record for the longest distance travelled by kite power on land. It’s a long story, but while we did reach the finish line 1,000km later, we ran out of food on the way and ended up eating coconuts and other wild fruits growing along the coastline. They tasted amazing and were nutritious too. This sparked an idea…why can’t all food be like that? Wouldn’t it be good if everyone could indulge in their favourite sweet treats, without compromising on health? We started with ice cream, which took 25 months to develop. Most people we spoke to insisted that it just wasn’t possible. We disagreed. Oppo would taste delicious… and be healthy. Creating a healthier ice cream can’t have been easy, what’s the biggest thing you’ve learnt along the way? By far the biggest challenge was doing something that hadn’t been done before. For industry professionals, a healthy and indulgent ice cream just wasn’t possible. They had tried and insisted that there would have to be a compromise. However, sometimes not knowing the rules makes it easier to break them. We also learnt that how long you think something like this will take, you generally need to multiply it by three! What’s a typical day like a Oppo HQ, if there is such a thing? We’ve now graduated off the kitchen table and have a real office… there are eight of us working at Oppo full-time (plus Poppy the spaniel!). However, there still isn’t a typical day at Oppo… We can be taste testing in the office, planning events, visiting our factory or meeting new Oppo stockists. We are big fans of your ‘Don’t Tax Healthy Campaign’ (a campaign to cut VAT to 5% on lower sugar products). What’s your take on where the sugar debate is heading at the moment? Do you think enough is being done to make healthier food available to everyone? The sugar tax is a step forward in preventing obesity, however in creating #DontTaxHealthy (and partnering with Peppersmith on it!) we believe that instead of punishing sugar intake, we should incentivise the consumption of food and drink with lower sugar by cutting VAT on these products to make them more affordable. So good steps are being taken, but until you can make it easier and cheaper for people to access low sugar versions of their favourite sweet treats (and providing they taste as good), sugar consumption will still be too high and therefore create problems in our society. You use Stevia and Erythritol to sweeten your ice cream, instead of sugar. Could you tell us why you chose these sweeteners in particular? Do you have a view on the other sweeteners out there? 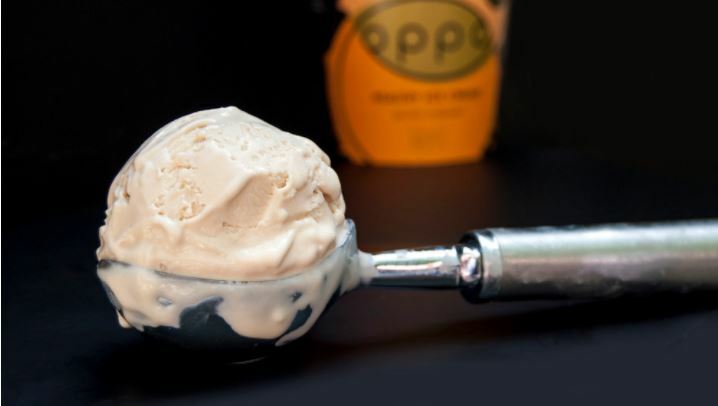 For us, we want Oppo to be comparable on taste with other luxury ice creams, without the excess sugar levels. Both stevia and erythritol are zero calorie and have zero effect on blood sugar. Also, used in conjunction with each other they taste great and come from natural sources (unlike many other sweeteners). Xylitol is great too, though it didn’t quite work in our ice cream recipe. Don’t believe a word you hear about ‘un-refined’ sugar though – your body treats the sugar from expensive products like agave syrup in exactly the same way as simple table sugar. If you want to reduce the sugar in your diet and still enjoy sweetness, sweeteners like stevia, erythritol and xylitol are a great way to go. And lastly, the big question… what’s Oppo’s big mission? Where do you see the brand in 10 years’ time? Our mission is to allow people everywhere to enjoy their favourite sweet treats, without feeling like they have! We want to show that you can have both health and indulgence without compromising. We are developing more ice cream flavours from our current 4, and at some point will look at food categories outside of ice cream too! The post The guys behind Oppo: the healthy ice cream appeared first on Peppersmith.